20B is a highly-sensitive magnetic particle premix powder for locating fine discontinuities in high volume applications, such as forging, casting, stamping and welding. 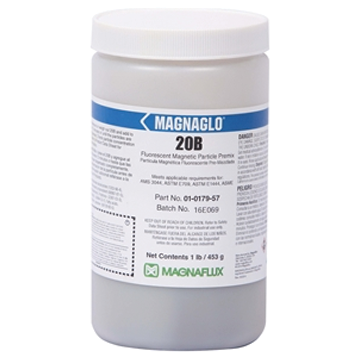 Combining Magnaflux’s best-in-industry 14A magnetic particles, corrosion inhibitors and wetting agents, 20B is an easy-to-use premix for making magnetic particle water bath. The ultra-sensitive 14A particles provide clear, bright, fluorescent green indications under ultra-violet black light for unbeatable inspection quality and accuracy, and the water conditioners provide corrosion protection and complete surface wetting.